Rupert Gaston, 30, of Etherington Place, Littlehampton, was fined £220 and must pay £30 victim surcharge, £100 costs, after admitting being the registered owner of a vehicle that did not meet insurance requirements in Worthing on November 8, 2017. Reece Hills, 24, of Honeysuckle Close, Littlehampton, was fined £320 and must pay £32 victim surcharge, £85 costs, after admitting driving without due care and attention in Lyminster Road, Littlehampton, on December 23, 2017. His driving record was endorsed with nine points. Callum Kinsella, 31, of Tower Road, Lancing, was fined £100 and must pay £30 victim surcharge, £85 costs, after admitting drug-driving (17.5 Delta-9-THC) in Greentrees Crescent, Lancing, on February 24, 2018. He was disqualified from driving for 12 months. Joseph Kearney, 21, of Offington Drive, Worthing, was fined £92 and must pay £30 victim surcharge, £85 costs, after admitting failing to stop at a red light in Old Shoreham Road, Portslade, on September 18, 2017. Daniel Barnett, 32, of Clun Road, Littlehampton, was given a community order and must carry out 80 hours’ unpaid work after admitting harassment without violence, by visiting without invitation, following, numerous phone calls and numerous text messages between February 16 and May 8, 2018. He must pay £85 victim surcharge, £85 costs. Julie Peacock, 51, of Wyck Court, St Aubyns Road, Fishersgate, was given a community order with Rehabilitation Activity Requirement after being found guilty of assault by beating in Fishersgate on December 7, 2017. 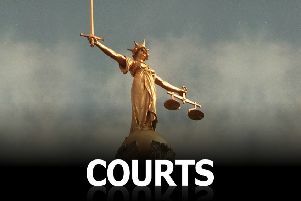 She was also given a restraining order and must pay £85 victim surcharge, £620 costs. Martin Poole, 40, of Cortis Avenue, Broadwater, was given a 12-week prison sentence, suspended for 12 months, with Rehabilitation Activity Requirement and must carry out 120 hours’ unpaid work after admitting assault causing actual bodily harm in Broadwater in July, 2017. He was also given a restraining order and must pay £115 victim surcharge, £85 costs. He was given a 12-week concurrent prison sentence, suspended for 12 months, after admitting stalking without fear, alarm or distress, including leaving a pair of boxer shorts on a car, in Worthing between November 1, 2017, and January 6, 2018. Theresa Carey, 52, of The Willows, Grinstead Lane, Lancing, was fined £276 and must pay £30 victim surcharge, £85 costs, after admitting drink-driving (54mg of alcohol in 100ml of breath) in Brighton Road, Worthing, on May 20, 2018. She was disqualified from driving for 15 months. Tobi Chipper, 20, of Brecon Close, Durrington, was given a community order with Rehabilitation Activity Requirement and must carry out 120 hours’ unpaid work after admitting taking a vehicle without consent in Worthing on May 20, 2018. He must pay £50 compensation, £85 victim surcharge. He also admitted driving without due care and attention, failing to stop when required by a police constable, driving without insurance and driving without the correct licence, in Mendip Road, Worthing, on May 20, 2018, no separate penalties. He was disqualified from driving for six months due to repeat offending. Tasha Wallace, 34, of Fenwick Place, Lambeth, was given a community order with Rehabilitation Activity Requirement after admitting jointly stealing goods from Boots, Worthing, on May 19, 2018; jointly stealing goods from TK Maxx, Worthing, on May 19, 2018; jointly stealing goods from Top Shop, Crawley, on May 19, 2018; jointly stealing goods from New Look, Crawley, on May 19, 2018; and jointly stealing goods from TK Maxx, Crawley, on May 19, 2018. She was also fined £40 for the first offence and ordered to pay £85 victim surcharge, £85 costs. She also admitted breaching a suspended sentence order, which was amended by being extended from six months to eight months. Edward Elsden-Smith, 22, of Offington Lane, Worthing, was given a community order with three-month curfew, electronically monitored, from 7pm to midnight on Fridays, midnight to 7am and 7pm to midnight Saturdays, midnight to 7am Sundays, Building Better Relationships programme requirement and Rehabilitation Activity Requirement after admitting three charges of assaulting a police constable in the execution of their duty in Offington Lane, Worthing, on May 19, 2018. He must pay a total of £200 compensation, £85 victim surcharge, £85 costs. He also admitted breaching a suspended sentence order, which was amended by being extended from 18 months to 21 months. Jackson Holt, 24, of Seymour Close, Portsmouth, was given a community order and must carry out 100 hours’ unpaid work after admitting stealing clothing worth £120.99 from Sports Direct, Worthing, on May 22, 2018. He must pay £85 victim surcharge, £85 costs. He also admitted breaching a suspended sentence order, which was amended by being extended from six months to seven months. Julia Mahoney, 38, of Vassall Road, Lambeth, was discharged conditionally for two years and must pay £20 victim surcharge, £40 costs, after admitting jointly stealing goods from Boots, Worthing, on May 19, 2018; jointly stealing goods from TK Maxx, Worthing, on May 19, 2018; jointly stealing goods from Top Shop, Crawley, on May 19, 2018; jointly stealing goods from New Look, Crawley, on May 19, 2018; and jointly stealing goods from TK Maxx, Crawley, on May 19, 2018. Jack Moorey, 19, of Columbine Way, Littlehampton, was fined £207 and must pay £30 victim surcharge, £85 costs, after admitting being in charge of a vehicle while over the drink-drive limit (64mg of alcohol in 100ml of breath) in Windsor Drive, Rustington, on May 4, 2018. His driving record was endorsed with ten points.